We believe that school is hard enough as it is, and wanted to build something awesome that helps schools, faculty members, and students. Something that would enhance the school experience for students, increase engagement and retention, decrease confusion, and that focused on the details of how this could work for that majority of educational institutions out there. With all of that in mind, we built Polytechnic. Teachers can add/update their own courses and provide students with up to date information regarding homework, study guides, notes, and a tentative schedule based on a specific course section. Students can get course specific information if they missed class, check to see what time the pre-game rally is on Friday, get course catalog information online, and purchase required reading materials with a click of a button. And admins can oversee it all, monitor the flow of information, and have the ability to add, edit, assign, and delete course information and users. Because your faculty should feel proud to login to your schools site! Customize the login for your users to match your school with easy to use options. Go ahead, check it out. Choose or upload your login logo, position the login form location, add a background image, set a color fallback, and add custom html! We’ve included a drag and drop mega menu to provide a compelling way of displaying menu items and additional content on your site. Now you can choose to use a flyout menu or mega menu for each parent item. We’ve built a sticky header right into the theme and gave it it’s own options panel. Setup is easy and will extend the usability of your site for your users. Add your own custom logo, menu, and customize away with our theme options. This section is triggered with the (top left) tophat tagline trigger and reveals a new section of widgets. These widgets are easliy managed in Appearance > Widgets and we’ve even included a custom options panel to customize this section further. We’ve built some powerful templates for you to use. These templates are customizable and can be used as many times as you like and include: Post Grid, Blog, Course Catalog, and Faculty Grid (yes, it actually filters users). Each of these templates offer custom options to help building with these templates a breeze. Oh, and did we mention that you can also use Visual Composer on any of these pages to add even more content. The combinations are endless. Teaching coursework has never been easier, all within WordPress. With the Sensei plugin you can create courses, write lessons, and add quizzes. Set lesson and course pre-requisites, allow user registration and even charge for your course content if you want. Simply put, we’ve included “out of the box” support for the “Sensei” plugin by Woo Themes for extended features and functionality for schools that want to take their courses and lessons to the next level. This plugin is not included with the theme, and users who want to utilize these extended features will need to purchase a license through Woo Themes (http://www.woothemes.com/products/sensei/). 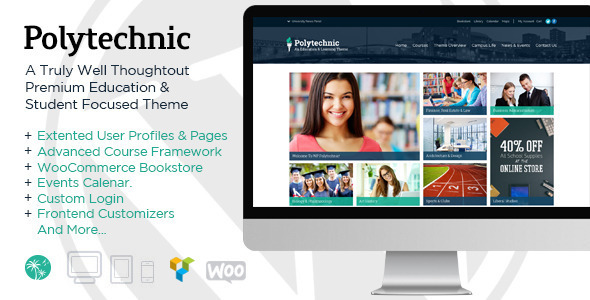 This plugin is not associated with the Polytechnic Courses provided with the theme. User interaction has many benefits. One is that it can create focus and increase audience retention. Use Visual Composer to add these exclusive custom hover modules to your content. Don’t forget to add links and calls to action with these Custom Hover Modules to increase internal traffic and interactions. Choose a custom image, background color, add custom content, and select a start height and end height for the modules on that page. We’ve extended this plugin to handle parallax backgrounds for full-width rows. This makes it even easier to add in your content and break it up visually with this custom feature. The most popular & easy to use “mega slider” plugin to ever exist!!! OK, that’s hyperbole, but it’s honestly pretty great and we’re thrilled to announce that we are now including Revolution Slider 4. This latest version includes: brand new admin interface, more options, more conveniences, custom caption animation builder, full slider import/export, and much more! You can also include Revolution Slider as your ad space slider, pre-content slider, sidebar slider and within individual posts/pages. Sweet! We are fully including Contact Form 7 to provide users with a quick and easy way to build and manage contact forms. It can manage multiple contact forms, plus you can customize the form and the mail contents flexibly with simple markup. The form supports Ajax-powered submitting, CAPTCHA, Akismet spam filtering and so on. Try typing in the search-bar (in the sidebar or on the “tophat”). The Live Search feature allows users to instantly skim your site for relevant material without every loading another page. We were one of the first theme crews to dabble in ‘responsive design’ way back in the day, so we know a thing or two about how to do this properly. Fluid grids are used at larger breakpoints, and fixed widths are used on smaller devices to ensure ideal spacing. The type size shifts on smaller devices to be larger and easier to read, and images and other media are sandboxed to prevent anything from breaking the layout. Nearly all of JetPack should work well with this theme (the Tiled Galleries are the only exception since those aren’t responsive); if you want to start using the next level of WordPress functionality, you’ll get it here. To take this even further, we added custom options that show up depending on the page template used. This includes page template specific options for theBlog Page & Post Grid (Portfolio) page templates. These panels will show up on any page with the Blog Page template or Post Grid template selected. Eliminate the guesswork from customizing the theme. Built on the WP Theme Customizer API with some special tricks blended in, you can change just about every typographic or color across the entire theme; there’s no need to reload the page on the front-end though; the Theme Customizer will show you an instant preview of what your changes look like right there on the same screen. ** Have a feature request? Let us know! This entry was posted in Wordpress Themes and tagged catalog, classes, college, course management, courses, customizable, depositfiles.com, download free, download rar, download theme.rar, download theme.zip, download wordpress theme, download zip, education, events calendar, faculty, free, free wordpress theme, get rar, get zip, Index Of, mirrorcreator.com, nowdownload.ch, nulled, nulled theme, Parent Directory, rar, school, skeleton, ul.to, university, zip, zippyshare.com by wordpress. Bookmark the permalink.